The D-Link Wireless Media Player with DVD (DSM-320RD) connects your home entertainment center to an existing network, allowing you to wirelessly stream music, photos and videos from the PC to your television and stereo system, all without running cables throughout the house. 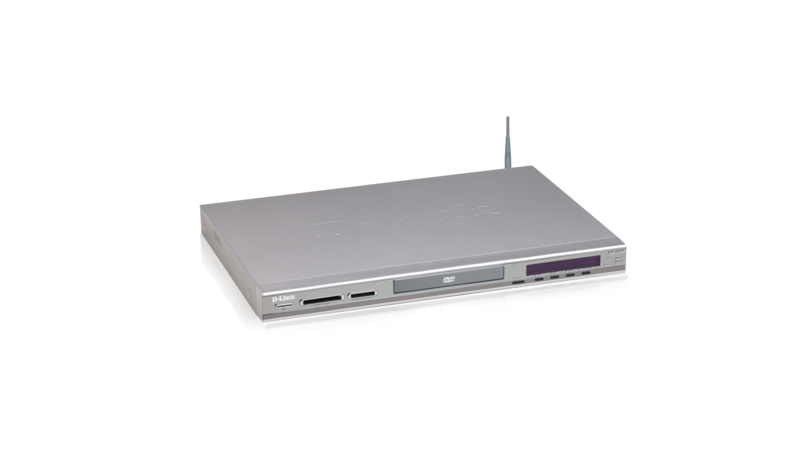 The DSM-320RD is built-in with progressive scan DVD player and 5-In-1 Memory Card Reader. MediaLounge™ DSM-320RD Wireless Media Player with DVD and Card Reader. The DSM-320RD connects your home entertainment center to an existing network, allowing you to wirelessly stream music, photos and videos from the PC to your television and stereo system. Using 802.11g wireless technology, the DSM-320RD streams media content at a maximum wireless signal rate of up to 54Mbps1. You can also stream media content via Ethernet. The DSM-320RD integrates seamlessly with your existing wired or wireless network. Progressive scan technology delivers a sharper, flicker-free image from your DVDs for a cinema-like experience. In addition to DVDs, this DVD Player will also play SVCD, VCD, CD-R, DVD±RW, CD-RW, CD, and MP3 discs2. The DSM-320RD also features a built-in 5-in-1 card reader, which provides a convenient way to view and share digital photos, music, and videos stored on a memory card. Popular memory cards, including SD, Memory Stick, MMC, and Compact Flash (Type I and II) are supported. Get access to thousands of songs right from your living room. D-Link has partnered with premium online service providers to offer access to a vast array of online radio stations and PC music downloads. And now, with support for Windows® Media Connect3, files protected by Windows® Media Digital Rights Management (WMDRM) can be streamed from your PC to your living room. Setting up the DSM-320RD is simple, and with support for Windows® Connect Now, configuring the wireless settings is easier than ever before! Simply run the Wireless Network Setup Wizard from Windows XP Service Pack 2 and transfer the wireless settings to the DSM-320RD using a USB flash drive4. Experience digital media like never before with the MediaLounge DSM-320RD Wireless Media Player with DVD and Card Reader. The DSM-320RD provides instant access to digital music, videos, and photos all from the comfort of your living room. This device supports the codec file formats listed herein, however D-Link cannot guarantee full compatibility or proper playback with all such codec files due to modifications and/or other variations that may occur with the end-user’s encoded codec files. Certain file formats and/or features are not accessible from memory cards attached to the card reader. Connect Windows Media Connect to DSM-320RD as media server. 1. Maximum wireless signal rate derived from IEEE Standard 802.11g specifications. Actual data throughput will vary. Network conditions and environmental factors, including volume of network traffic, building materials and construction, and network overhead, lower actual data throughput rate. Environmental factors will adversely affect wireless signal range. 2. Some discs may be incapable of proper playback due to laser pickup and disc design. The DVD player feature may not support some MP3 discs due to differences in recording formats. 3. Windows® Media Connect can be downloaded using Windows Update on your computer. 4. USB flash drive sold separately. All references to speed are for comparison purposes only. Product specifications, size and shape are subject to change without notice, and actual product appearance may differ from that depicted herein.